We’ll keep this simple. The Toyota Yaris iA had a 1.5 liter direct injected four cylinder engine that made 106 horsepower. With power outputs this low you have to look a little deeper than usual to get the torque and so it was with the iA. However the spec sheet showed an output of 103 pound-feet of torque at 4,000 rpm. The Toyota iA comes with either a six-speed automatic or six speed manual transmission. We had the manual gear box and it was surprisingly pleasant to drive. Normally, we don’t care for lower horsepower engines mated to manual gear boxes but the iA was different. Up shifts were smooth, we never sensed that the gear box was ill-fitted to the engine and we never felt like the car was underpowered. Transmission and engine were nicely matched. Downshifts were smooth too. It was a nice car to drive. Acceleration was steady and of course it wasn’t close to blistering. The Toyota Yaris iA was not quick but it was not slow either. Perhaps because of the manual gearbox it wasn’t sluggish at all. There was a bit of pep. Cornering was good as were the slight lines. And never did we feel like we were driving a five-door sedan. Of course at this price point, there were not a lot of creature comforts. There was no moon roof, no satellite radio, certainly no navigation system and no voice controls. However, the car did have Bluetooth that could connect to Pandora or Aha on your smartphone. There was an HD radio that sounded pretty good and Bluetooth would reach out and grab music off our smartphone automatically. They did a couple of smart things to keep cost down. There was push button start/stop but no push button lock/unlock. And the mirrors were not of the automatic dimming variety. Inside, the car was nicely done. The dash was constructed of soft touch material. It also had a silver colored blade that ran across the middle of the dash and split it in half. There was nothing on the upper half save the information screen, which was mounted perpendicular to the dash. The bottom half held the three dial climate control unit and beneath that was a storage cove. That was where Toyota put two USB jacks and one auxiliary jack. There was a 12V plug there too. There was a carbon fiber patterned trim used around the doors, center console, steering and climate vents. It broke up what would have been an awful lot of bland surfaces and gave them some texture. This layout was clean and simple. And the materials used were pretty good. Thus the interior did not look or feel cheap. The seats were two toned. The seating surfaces and backs themselves were a blue and black herringbone. While the side and leg bladders were black. The headrests were long and they made the front seats look like sport seats. We got into the back seats and found the rear doors a little short. In other words, they were more vertical than horizontal. There was plenty of headroom, but the legroom was a little cramped. However, we were sitting behind the driver’s seat and had not slid it forward even a little. We think it would be a snug fit but four adults could get into the Toyota iA. At $16K, the 2017 Yaris iA is certainly for the price conscious. 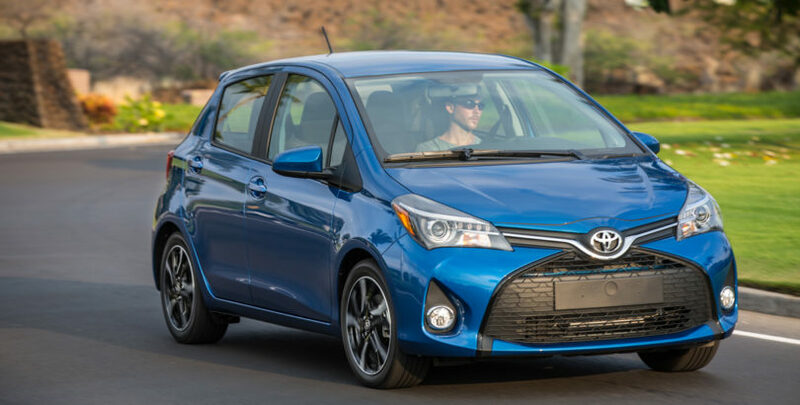 But it is a nicely equipped small hatchback that is not a drudge to drive, has some style and because of it’s a Toyota it is a reliable piece of machinery.